You know what the Greek people used to say? They proposed a concept centuries ago that the world is made up of four basic elements namely Air, Earth, Water and Fire. Well their ideas were proved to be wrong after all but their ideology still lives on even today. 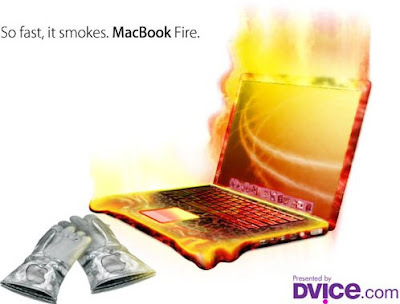 MacBook Air is already out in the market so who says that we shouldn't expect a MacBook Earth, Water and Fire too. Dvice has made an excellent concept parody of these devices by designing their graphical mockups and giving a short, meaningless yet funny description to all of them. Surprisingly this is the greenest laptop ever lol. 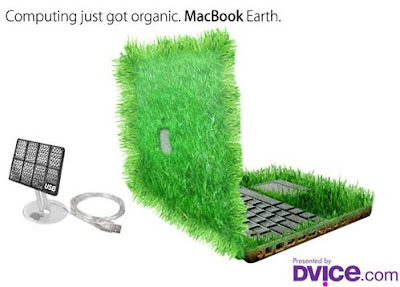 Powered by solar energy and covered with bio materials such as grass etc it is the best laptop to be made buried ever. 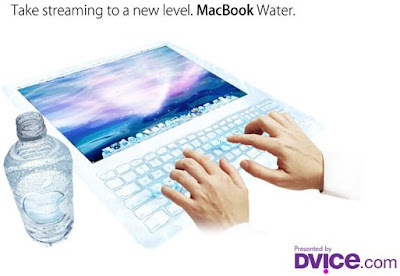 MacBook Water is an iFluid device that has less booting time than a cell phone. Pour the fluid on a flat surface to get the MacBook Water started and to close it simply wipe the fluid off the surface. Storing it at temperate below 0°C voids the warranty of the product lol. begin to glow. The casing is heat resistant and to save your hands from burn injuries Apple gives you asbestos gloves free with the device lol. Honestly I have seen a lot of gadget parodies lately including ones for iPod Touch, Apple TV, iPhone and other such devices but this parody for MacBook Air is simple off the hook. Hilarious to death! Original laptop computer dressed in woman underwear.